Wheat in Kansas; photo by Brent Danley on Flickr (noncommercial use permitted with attribution / share alike). The name "Harney" (meaning "people") is derived from native American (the Wichita word for Pawnee is "harahey"), and stems from the explorer Coronado's journey across Kansas. Kansas soils are known around the world for their exceptional qualities, and agriculture is the number one industry of the state. Harney silt loam covers almost four million acres in west and central Kansas (Kansas has more acres of prairie soils than any other state). Harney silt loam and other rich prairie soils make Kansas the number one state in wheat production. Though Kansas has a great agricultural heritage, about 190 million tons of Kansas topsoil are degraded each year through human activities, and continual soil erosion by wind and water also contribute to loss of topsoil. 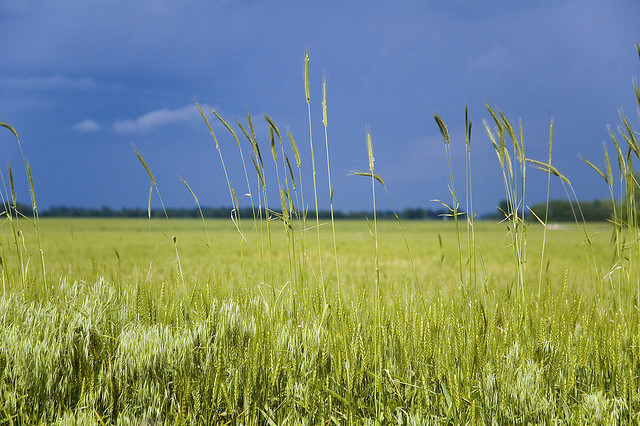 An unprotected crop field can lose an inch of topsoil in just one or two years due to wind erosion and heavy rains (this loss is not reversible, as it requires 500 years to develop an inch of topsoil under prairie grasses).